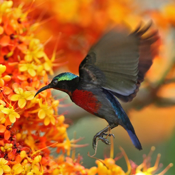 This mobile field guide for the Birds of Singapore from the Nature Society (Singapore) features 554 bird stunning photographs of all the 375 species published in the 2011 Bird Group’s Records Committee’s Checklist. All photographs were selected for their distinctive features to facilitate identification. Species known to be dimorphic have pictures of both genders shown while images of Raptors in flight are highlighted as well. We have also incorporated about 100 bird calls and songs to help with the identification of birds in the field, a very important and sought after aid.